A24 has quickly established itself as a fearless distributor and producer of truly unconventional cinema. Looking back over the scant three years they have been in existence they have produced some of my favorite film moments of this period. These aren’t epic blockbusters or breezy popcorn munchers but rather more subversive films with a sharp arthouse edge: Spring Breakers, Under the Skin, Locke, The Rover, Ex Machina. Films that stay with you, that ask questions of you, that engage you. It’s incredibly important to keep that context in mind when viewing The Witch. This isn’t a formulaic horror cash-in with cheap jump-scares and an eye on establishing a franchise. It’s not a spook-house monster thrill-ride, nor a snarky self-aware slasher. The Witch is an incredibly atmospheric and profoundly unsettling period piece with a flavor for the abstract. Don’t expect some pedantic professorial type to shuffle in during the second act offering exposition detailing the plot or spelling out the rules for dealing with the phenomena encountered. It just isn’t that kind of film, and if you’re expecting to go to the theater for a fun night of spooky hijinks then do yourself and the rest of the audience a favor and wait for the next dumb Paranormal Activity installment. 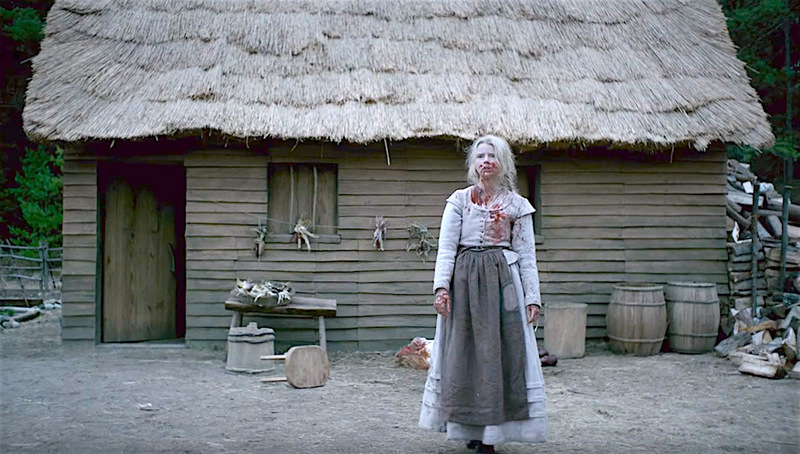 However, if you’re willing to allow the richly woven ambience of The Witch to envelop you, be prepared to encounter a horror film experience like no other. As mentioned, this is a period piece and is absolutely uncompromising in its depiction of Puritanical 1630’s New England, from wardrobe and sets to lighting and the vernacular. Particularly the vernacular. I imagine it’s a stumbling block for some, as nothing is done to soften or make modern the language of the era. For my part I found it a particular joy. The propriety of communication, the density of phrasing, the heavy Biblical references all served to give direct insight to the characters and their worldview. It’s critical to understand the importance of faith to this family and we see it saturating every facet of their existence. 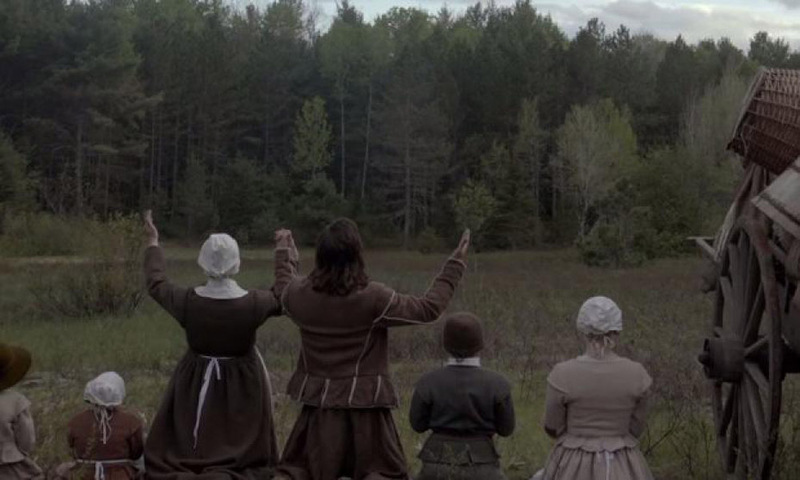 Exiled from their Puritan settlement at the start of the film, the family makes their way to a clearing near a dark wood and establish a farm. They have little but their faith to sustain them, and as we jump ahead a year or so we find them struggling to get by. They have lost their youngest child, their crops are failing and they have begun to question their ability to persist. It is in this climate of desperation that our story is born. The Witch is a film that savors kindling a certain uncomfortable nausea in the audience, a leverage point for the more stark horror elements. Punctuated by an intense soundtrack comprised of era-specific instrumentation and a creepy vocal chorus, these moments of raw humanity are just as squirm-inducing as any scalpel-slice of a ligature or eyeball-popping scene you might find in a film more steeped in gore. Perhaps even more so for their bald reality. Simple lies and deception that blossom into unapproachable revelations, the effects of dementia brought on by grief, a brother’s pubescent lust for his sister – these gut-churning awkward scenes expose tiny cracks in the pious façade of the family’s staunch Puritan faith, setting the tone for what proceeds. And what proceeds is dark indeed, ushered along by brilliant emotive performances from both the adult and child cast. The suffering is not only seen, but felt and intensely so. Kudos as well to the cast for their expert handling of the challenging dialogue. To speak in such archaic fashion while losing none of the rapport built with the audience is no easy task but it is capably managed here by all involved. The level of engagement provided is necessary, this isn’t a casual horror experience, and one can’t help but feel a personal connection, particularly in regard to the family’s teenaged daughter Thomasin (Anya Taylor-Joy). The film is careful and deliberate in its depiction of Thomasin as a protagonist, and I feel that there is more at work here than simply staging yet another young woman in peril as the central character of a horror movie. We see from her perspective the challenge of coming of age, both in terms of her blossoming womanhood and in the onset of adult responsibilities which may rob her of her free will. While providing a historical context for the plight of young women in the era leading up to the witch trials we also find the modern dilemma engaged. How youth and beauty and free will are seen as a threat or a challenge. How a life hemmed in by familial and religious structure can leave one with a taste for something more, something beyond that. It’s one of many themes The Witch explores, and subtly so. On the surface it can read very much like a simple reimagining of horrific folk tales of the era as told through the experience of a single family. It’s in the way it tells the story and the depths that are sounded with those more abstract moments, in its presentation of the things that may or may not be supernatural, that it reveals itself to be much more than that. It evokes a psychological fracturing that you can’t help but be affected by. It teases a pitch black void upon whose outer edges we stand. It chills the blood. It curdles the milk of the soul. Clearly, I’m a bit taken with The Witch, though I know many who aren’t. It’s being derided as “arthouse horror” and “hipster horror” by a certain enclave of horror purists. The abstraction, the setting and dialogue, the soundtrack all mark this as something quite different and I understand why fans of traditional horror may be turned off by it. It’s not typical of the genre and some may resent that it has been very much marketed as of the genre, “the next big thing in horror,” in an attempt to get people out to the theater. Whether due to a discrepancy in expectation or because the film is simply a bit too challenging for some, I found myself in a theater whose audience snickered and giggled at a few of the more bizarre moments. What I found transcendent they found cause for uncomfortable laughter. 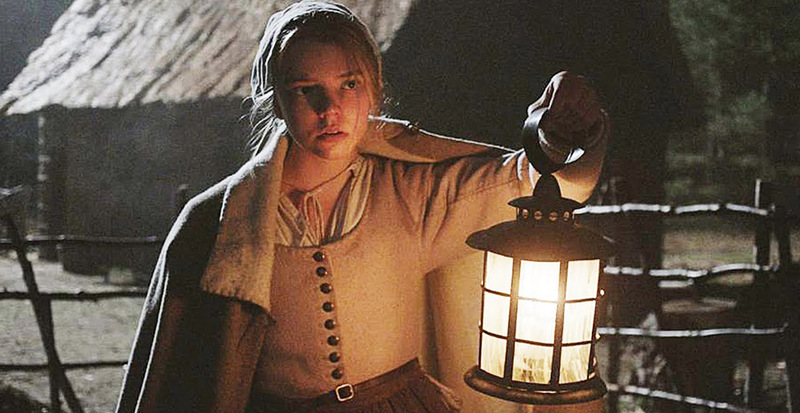 The Witch may be divisive that way, but I’m unafraid to recommend it. It’s a powerful film that just happens to take place within the boundaries of horror. If you’re not put off by being pushed outside of your comfort zone, you just may find it a revelation.